Sometimes the way we think is what gets in the way of our being as successful as we can be. Everything I needed to know I learned in …high school? Some of you readers may know that when I’m not working on the business of Pharo Cattle Company, I “moonlight” as a college biology professor. Recently, I decided to take a temporary hiatus from my usual work to pursue a high school teaching certificate. (I’m thinking that someday I may want to trade in my 60-mile commute to the college for a walk across the street to the local high school.) At the moment, I’m in the final phase of my certificate, which involves one semester of student teaching with a nearby high school. These kids needed a real-world transfusion, and they needed it fast. Suddenly, this teacher had a thought bubble of her own. I asked the kids to get on the Internet and find the price of feeder steers of several different weight classes. Next we talked about how to find out how much cows eat as a percentage of their body weight. Then we discussed the costs of maintaining a lactating cow – both on pasture and on hay. Finally I turned them lose on the essential Herd Quitter questions…. pasture or hay? Small cows or large cows? Which paradigm is more profitable – increasing pounds per animal or pounds per acre? I live in an agricultural community, but these were questions the kids had never considered. I saw the glazed looks turn to quizzical looks, and then to determined looks, and I knew we were off to the races. We set up the algebra problems on the board – the math is not too tough, and it’s pretty darn convincing. Later that evening… I reflected on how different it was to engage the profitability question with kids versus adults. My students approached it with curiosity, open minds and enthusiasm. They didn’t have any preconceived notions, and they weren’t previously invested in a line of thinking that prevented them from getting excited about the most profitable solution. My students taught me a lot about myself and my fellow adults that day. 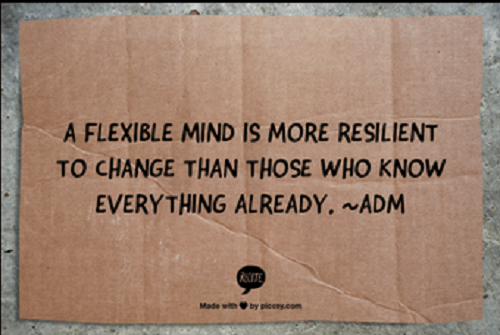 As the years go by, we certainly make gains in wisdom – but it’s all too easy to lose our mental flexibility. The more years we have accumulated, the more invested we become in the way we have thought in the past, instead of the way we might think in the future. We forget to take joy in a fresh perspective. It caused me to consider my concept of a Herd Quitter in a new light. To me, Herd Quitters are people who are capable of making mental leaps throughout their lifetimes, rather than clinging blindly to whatever dogma they started with as young people. We can leave all the responsibility for change and adaptation to the next generation, and go out resisting, kicking and screaming. Or we can partner with them and share our wisdom – but only if we stay flexible. Previously published in the October 7, 2015 Pharo Cattle Company Update. If you’d like to receive their updates directly, you can sign up for them here.